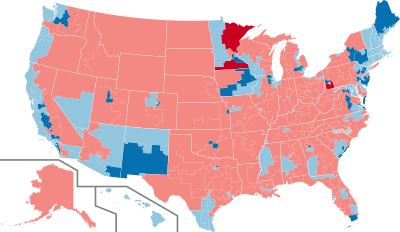 The 2018 midterm elections were a series of local, state, and Federal elections held in the United States on 6 November 2018. These included elections for all members of the US House of Representatives, 35 US Senators, 39 state and territorial governorships, and the majority of state legislative seats. The 2018 midterms have been widely described as a “blue wave” on account of the major gains made by the Democratic Party. Notably, Democrats won 40 net seats in the US House of Representatives, giving the party control of the chamber. At the state level, Democrats took full control of the governments of Colorado, New Mexico, Illinois, Maine, New York, and Nevada. Democrats also won governor’s races in Kansas, Michigan, and Wisconsin while flipping both houses of the New Hampshire state legislature, thereby breaking Republicans’ full control over those states’ governments. Republicans had more success in the US Senate, where Democrats were defending the vast majority (26 out of 35) of the seats up for election. Republicans expanded their majority by flipping Democratic-held seats in Florida, Missouri, Indiana, and North Dakota. Democrats were able to temper GOP gains by flipping Republican-held seats in Arizona and Nevada. The 2018 midterms have generally been seen as a referendum on the professional dumpster fire presidency of Donald Trump. Given that the GOP generally did badly, most pundits have concluded that this means most voters don’t approve of Trump. Trump, however, appears to have learned the opposite lesson. Inspired by Republicans’ modest gains in the Senate, he has doubled down on his most absurd policies and rhetoric, notably by shutting down the Federal government as leverage to get funding for a border wall. Republicans have largely continued to support Trump, apparently having learned nothing from their midterm shellacking. The Virginia Governor’s Election— In Virginia’s 2017 gubernatorial election, Democrat Ralph Northam decisively defeated Republican Ed Gillespie. While Northam’s victory by itself was not so surprising, given that Virginia already had a Democratic governor, his margin of victory was. Northam won the election by 9 percentage points; by comparison, Hillary Clinton had only won Virginia by 5 points in 2016, while Northam’s predecessor, Democrat Terry McAuliffe, won by less than 3 points. Virginia Legislative Elections— In addition to its governor, Virginia held elections for its lower legislative house, the House of Delegates. Democrats gained 15 net seats while tying in a 16th. Republicans were able to keep control of the chamber only when they held that 16th seat in a coin flip. The Alabama US Senate Special Election— After Grand Wizard Senator Jeff Sessions became the US Attorney General, the State of Alabama held a special election to fill his Senate seat. The election was expected to be a Republican layup, until the primaries happened. Democrats nominated Doug Jones, a Civil Rights attorney and moderate Democrat with the ability to appeal to voters across the political spectrum. Meanwhile, the GOP nominated Roy Moore, a former judge whose racism and Christian fundamentalism were considered extreme even by Alabama standards. During the campaign, it was revealed that Roy Moore had a history of molesting teenage girls. Combined with strong turnout from Alabama’s large black community, this scandal was enough to carry Jones to a narrow victory, making him the first Democrat to win a Senate race in Alabama since 1992. The PA Special Congressional Election— Pennsylvania’s 17th Congressional District held a special election on 13 March 2018 after its previous incumbent, Republican Tim Murphy, resigned over a scandal. Despite the fact that this district voted for Trump by nearly 20 points, Democrat Conor Lamb managed to narrowly carry it. The Wisconsin Supreme Court Election— On 3 April 2018, liberal candidate Rebecca Dallet won a regularly-scheduled election to the Wisconsin Supreme Court. While the election was officially nonpartisan, Dallet was known to be a liberal candidate, openly declared herself to be anti-Trump, and was endorsed by Tammy Baldwin, Eric Holder, and Joe Biden. Other Results— On 7 November 2017, Democratic candidate Phil Murphy was elected Governor of New Jersey, giving Democrats full control of New Jersey’s state government. The same night, Democrat Manka Dhingra won a special election to the Washington State Senate, giving Democrats control of that chamber and thus all of Washington’s government. In addition to Dhingra’s victory, Democrats flipped 25 state legislative seats in special elections during 2017 and 2018, while Republicans only flipped 7 seats. In addition to election results, polls also suggested Republicans were in for a rough midterm cycle. FiveThirtyEight predicted that Democrats were likely to win between 36 and 39 seats in the US House of Representatives, with similarly bullish predictions from the Economist and CNN. US House results by party: dark colors are gains, light colors are holds. Kansas— Attorney and martial arts professional Sharice Davids won Kansas’s 3rd Congressional District, defeating Republican incumbent Kevin Yoder. A lesbian, Davids is the first openly LGBTQ person to represent Kansas in Congress. Davids is also of Ho-Chunk descent, making her the first American Indian woman elected to Congress in US history, in tandem with Representative Deb Haaland of New Mexico. Virginia— Democrats flipped Virginia’s 2nd, 7th, and 10th Congressional districts, giving them control of a majority of the Commonwealth’s seats in the House. All three Democrats who flipped these seats— Elaine Luria, Abigail Spanberger, and Jennifer Wexton— are women. California— Democrats flipped 7 Republican-held seats in California, giving them control of a staggering 46 of the state’s 53 Congressional seats. Notably, Democrats won every single Congressional district in Orange County, California, a suburban county that was formerly one of the most consistently Republican in American history. Georgia— Democrat Lucy McBath defeated Republican incumbent Karen Handel to represent Georgia’s 6th congressional district in the Atlanta suburbs. McBath, who tragically lost her son to gun violence in 2012, made her name as a gun control advocate. A black woman, she received little of the massive funding and press coverage that white male Democrat Jon Ossoff got when trying to flip this district in 2017, yet managed to succeed where Ossoff failed. New Jersey— Democrats nearly wiped out the Republican congressional delegation from New Jersey, winning 11 of the state’s 12 seats, compared to just 7 in 2016. One noteworthy new Democrat was Andy Kim, who defeated Republican incumbent Tom MacArthur in New Jersey’s 3rd Congressional District. Kim is the first Democrat in US history of Korean descent to be elected to Congress. As of 22 January 2019, one House district remains undecided: North Carolina’s 9th Congressional District. Based in the Charlotte suburbs, this district initially appeared to have narrowly elected Republican Mark Harris, but these results were thrown into question after evidence of election fraud surfaced. US Senate results by party: light colors are gains, dark colors are holds. Florida— Incumbent Democrat Bill Nelson narrowly lost to Republican challenger Rick Scott, who was then the sitting Governor of Florida. With a net worth of more than $200 million, Scott had virtually unlimited funds to spend on his campaign, allowing him to succeed in a purple state during an otherwise blue year. Missouri— Incumbent Democrat Claire McCaskill lost to Republican challenger Josh Hawley. McCaskill was hurt by political changes in Missouri, which has shifted from swing state to solid red state in the years since she was first elected. Indiana— Incumbent Democrat Joe Donnelly lost to Republican Mike Braun, a member of the Indiana House of Representatives. North Dakota— Incumbent Democrat Heidi Heitkamp lost reelection to Republican Kevin Cramer, who had represented North Dakota’s sole US House district. Given that North Dakota is one of the most Republican states in the nation, it’s frankly surprising that Heitkamp was ever elected in the first place. Arizona— Democrat Kyrsten Sinema defeated Republican Martha McSally to win a Senate seat formerly held by Republican Jeff Flake. Sinema thus became the first openly first bisexual person elected to the United States Senate, as well as the first woman to represent Arizona in the Senate. Shortly after losing to Sinema, McSally was appointed to fill Arizona’s other Senate seat, which had been held by John McCain until his death. Nevada— Democrat Jacky Rosen unseated Republican incumbent Dean Heller. With Rosen’s victory, both of Nevada’s US Senators are women. Another noteworthy election occurred in Texas, where Democrat Beto O’Rourke challenged Republican incumbent Ted Cruz. While O’Rourke lost, he came within 3 points of unseating Cruz, suggesting that Texas may be shifting from red to purple. Although the Senate results were considered a disappointment for Democrats, it’s worth emphasizing how difficult a position the party was in. Democrats were defending the vast majority of seats on the table, and in a less blue year, they would likely have lost far more. Democrats narrowly held onto Senate seats in Montana and West Virginia, two states that are usually solid red; they also won comfortably in New Mexico, Minnesota, Wisconsin, Michigan, Ohio, Virginia, Pennsylvania, and Maine, all swing states that would ordinarily be competitive. Netting two seats, then, was no great victory for Republicans. Gubernatorial results by party: dark colors are gains, light colors are holds. Illinois— Though otherwise a blue state, Illinois did have a Republican governor, Bruce Rauner, who was elected in the red wave year of 2014. Rauner lost to billionaire philanthropist J. B. Pritzker. Given that Democrats already held the state legislature, Pritzker’s victory gave the party full control over Illinois. New Mexico— Michelle Lujan Grisham defeated Steve Pearce in a landslide to win New Mexico’s open governor’s seat. Her victory gave Democrats full control of the state’s government. Lujan Grisham is the first Latina from the Democratic Party in US history to be elected as a state governor, as well as the first woman from the Democratic Party to be governor of New Mexico. Nevada— Democrat Steve Sisolak defeated Republican Adam Laxalt to replace term-limited Republican Governor Brian Sandoval. His victory gives Democrats full control of Nevada’s government. Maine— Democrat Janet Mills defeated Republican Shawn Moody to become Governor of Maine. Mills is the first woman to serve in the governor’s office. Combined with Democratic gains in the state senate, her victory gives Democrats full control of Maine. Michigan— Democrat Gretchen Whitmer defeated Republican Bill Schutte to become Governor of Michigan. Whitmer’s victory put an end to eight years of full Republican government in Michigan, though Republicans still control the state legislature. Wisconsin— After surviving three challenges over the past eight years, Wisconsin’s chief union buster, Republican Scott Walker, narrowly lost his bid for reelection to Democrat Tony Evers. Ever’s victory put an end to eight years of full Republican government in Wisconsin, though Republicans still control the state legislature. Kansas— Democrat Laura Kelly defeated Republican Vote Suppressor in Chief Kris Kobach. Kelly’s victory put an end to eight years of full Republican government in Kansas, though Republicans still have supermajorities in both houses of the state legislature. Republicans did not flip a single Democrat-held governorship in this election. However, Republican candidate Mike Dunleavy was elected Governor of Alaska. Dunleavy replaces Bill Walker, an independent who was generally considered closer to the Democrat Party, at least by Alaskan standards. Although Democrats generally performed well in governor’s races, they did lose several high-profile contests. Notably, progressive Democrat Stacey Abrams narrowly lost her bid to become Governor of Georgia, though she did come closer to victory than any Democrat since 1998. In Florida, progressive Democrat Andrew Gillum narrowly lost despite having led in the vast majority of the polls. Democrats also lost close races in Ohio, Iowa, and South Dakota. Weirdly, Republicans easily won governor’s races in the deep blue states of Vermont, Massachusetts, and Maryland. The Republican candidates in question all have moderate to liberal policy records, and have publicly opposed Donald Trump. Democrats also won supermajorities in all three states’ legislatures, limiting the power of those governors to challenge Democratic priorities. State Legislatures— Democrats flipped the Colorado State Senate and the New York State Senate, giving the party full control of both states. They also flipped the Minnesota House of Representatives. Democrats flipped both houses of the New Hampshire state legislature, putting an end to 2 years of full Republican control. In North Carolina, Democrats narrowed Republican majorities in both houses of the state legislature; as a result, Republicans in that state can no longer override the vetoes of Democratic Governor Roy Cooper. However, Republicans gained seats in the Alaska House of Representatives; it initially looked as if this would give the GOP control, but after a month of squabbling, a coalition of Democrats, Independents, and moderate Republicans resumed control of the chamber. Judicial Elections— Democrats made gains in judicial races in states that elect their judges. Notably, Democrat Anita Earls, a woman of color who ran an unabashedly progressive campaign, was elected to the Supreme Court of North Carolina, giving the party a 5-to-2 majority. Attorneys General— Democrats flipped attorney generalships in Wisconsin, Colorado, Michigan, and Nevada, though Republicans picked up an independent-held attorney generalship in Alaska. Ballot Initiatives— Ballot initiatives favored by Democrats passed in a number of swing states and red states. In particular, Florida passed an initiative to restore voting rights to most felons, while Michigan and Nevada passed initiatives allowing for automatic voter registration. Missouri, Michigan, Utah, and Colorado passed initiatives to creating nonpartisan redistricting commissions, a move that could potentially limit gerrymandering in the future. Screwing their Successors— In Wisconsin and Michigan, outgoing Republican governors Scott Walker and Rick Snyder have signed lamed-duck legislation designed to screw over their Democratic successors and the Democrat Party generally. In Wisconsin, Republicans have scaled back early voting so as to depress turnout among Democratic-leaning voters, limited the governor’s ability to appoint new members to the state’s economic development board, and prevented the governor and attorney general from withdrawing Wisconsin from an anti-Obamacare lawsuit. In Michigan, Republicans have made it harder to collect signatures for ballot initiatives, limited the ability of state regulatory agencies to adopt stricter standards than those of their Federal counterparts, and slowed a rise in the minimum wage. While these measures are of dubious legality and may not survive the courts, at the very least, they will slow down the incoming Democratic governors and other officials, who must now spend their first few months litigating instead of legislating. Update: A federal judge has struck down Wisconsin's lame-duck laws as unconstitutional. Reversing Redistricting Reform— Voters in Missouri passed a ballot initiative that would create the position of State Demographer, a nonpartisan office charged with drawing congressional and state legislative maps that represent each party fairly. This measure would have limited gerrymandering, thereby making it easier for Democrats to win in what is otherwise a solid red state. Missouri’s Republican governor, Mike Parson, has responded by calling to repeal this initiative and establish new measures that make it harder to have a statewide referendum. Shutting Down the Government— Donald Trump, who never managed to get funding for his ridiculous border wall when Paul Ryan ran the House, apparently decided he’d be able to get it from Nancy Pelosi. When Pelosi turned him down, Trump responded by refusing to sign any bill to fund the government, leading to the longest Federal shutdown in US history. On January 25, Trump finally caved, sort of, signing a bill that funds the government through Febuary 15. Republicans in Congress shown no signs of breaking with Trump and passing a bill to fund the government over his veto, even though those same Republicans passed a bill to fund the government without wall funding before Trump declared he wouldn’t sign such a bill. Declaring a National Emergency— On February 15, Trump declared a national emergency on the southern border, allowing him to use government funds to build the wall without congressional approval. The move is certain to be challenged in court, and has concerned some Republicans, who are worried that it will set a precedent for future Democratic presidents to declare national emergencies over issues such as gun control. A Shoutout to White Supremacy— Though not strictly a reaction to the midterms, Representative Steve King (R-IA) made some comments that seem to sum up the GOP’s values going forward. “White nationalist, white supremacist, Western civilization — how did that language become offensive? Why did I sit in classes teaching me about the merits of our history and our civilization?” King later insisted that these comments somehow do not make him racist. Overall, neither Trump nor his allies in Congress and state governments show any sign of moderation in response to the 2018 midterms. If anything, the GOP is only becoming more extreme, with potentially disastrous consequences for American governance.